With spring arriving late around us in April, Novotel Ambassador Gangnam offers a special picnic to its family BBQ party at the buffet restaurant, Festival. The special BBQ menu, available through June 20, features various seafood, meat and vegetables all cooked instantly by the chef with the freshest ingredients. 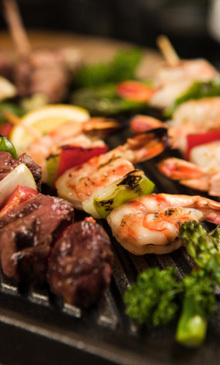 The BBQ menus, added to the regular buffet dishes, includes Grilled Sea Scallops, Marinated Squid, Sautéed Prawns and Crab, Lamb Chops, Beef Ribs, Sirloin Steak, Chicken Kebab with condiments, Assorted Vegetables. Guests can fill out the dish of selected ingredient for instant BBQ dish delivered directly to the table. ‘Festival’ is an international buffet restaurant featuring over 100 kinds of dishes from all over the world. It holds 140 seats with 3 private dining rooms to host a small group dining for family or business. A kid’s playroom is available for family guests as well.